Samsung Hercules Coming to Telus? It seems that a previously unannounced Samsung phone called the Samsung Hercules got a rather unsophisticated introduction to the world last night in Canada. MobileSyrup attended a Samsung event last night in Canada, and in the VIP area is where they spotted the phone you see above. 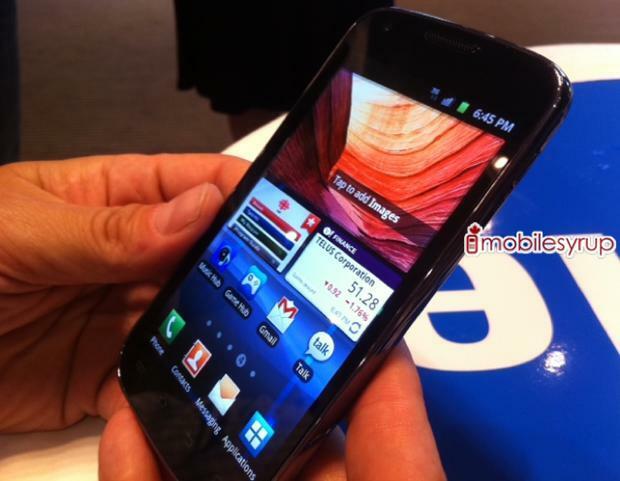 They described it as “a cross between the Samsung Galaxy SII, Nexus S and the Galaxy S Infuse” with the screen being around 4.5-inches. From what they could glean it will be running Android Gingerbread on a 1.2GHz dual-core processor with a rear 8 megapixel camera capable of shooting 1080p video and a front-facing 2 megapixel lens for video conferencing. What they do know for sure is that it was being referred to as the Samsung Hercules and that it appears it is coming to Telus. No pricing or release date information was available, but the fact it was being passed around at such a public event surely indicates that it has to be close to a release. From first glance, and only going by this one picture, I pretty firmly have to label this as “awesome.” The screen, even in a hastily shot photo, looks gigantic and clear, and makes me a tad jealous of the folks in the Great White North. What are your first impressions of the Samsung Hercules?